Come April 21, Google will start using a website’s mobile friendliness as a ranking signal in search results. Coined as ‘Mobilegeddon’ or ‘Mobileapocalypse’, the search engine magnate dialed up its pressure button for businesses that want to stay on top the game. When you have a mobile-friendly site, it will get a boost, while sites with usability issues on mobile devices, will get a significant drop in rankings, thus the need to update. Since Google’s announcement, there have been observations in an increase in demand for mobile-related design and development skills to help companies with the changes and updates needed, which basically is a no surprise knowing that there is no business exempted from this change and will gradually affect mobile searches in all languages worldwide. According to Venturebeat.com, 80% of all adults now own a smartphone and come 2016, 2 billion people are expected to get them, worldwide. Clearly, mobile matters more than ever! The question is, are you really prepared for the update? Well, if you find yourself scrambling to be mobile-friendly and indecisive between a dedicated mobile or responsive design, you might want to weigh in the pros and cons before making such decision. However, you have to think about your search rankings if your main goal is to increase leads and not flunk. Test your site. There is no other way to know it firsthand but this. By viewing your site’s listing in Google search results; you should see a “mobile-friendly” tag beneath your URL, which is a very legit proof that your site is spared from the incoming dilemma. However, it won’t be a ticket to exemption if you won’t keep some features updated. To know if your site is mobile-friendly, you may want to enter your web page URL in Google’s Mobile-Friendly Test to see how well it performs on a mobile device. Again, if it fails, you have to take action in updating it. If it passes, it may still need improvements before finally earning the ‘mobile-friendly’ tag. For a full rundown on issues that may affect your site’s search ranking, you may test it on Google’s PageSpeed Insights. Avoids software that is not necessarily supported on mobile devices. One example is Flash. Identify the correct fix for your site. With Google’s Mobile-Friendly Test and PageSpeed Insights, they have provided specific details for your site’s issues, and all you have to do is to check some options that are available to address them. Dynamic serving: This configuration involves using the same URL but a different version of HTML to serve different device types. Separate URLs: This is a method that serves a different code to different devices using separate URLs, by employing HTTP redirects. You need to ensure that Google sees it that way by signaling its mobile configuration. Doing so may vary the process by configuration. An example of which s if you have a responsive page, you need to add a “meta viewport” tag to the head of the document to signal to the browser how to adjust the page for different screen sizes, and so on. Before making any changes and updating everything, be sure to back things up. You don’t want to mess around, wouldn’t you? For more details on your options, you may consult guides from both Google and your CMS provider. Make it a priority. 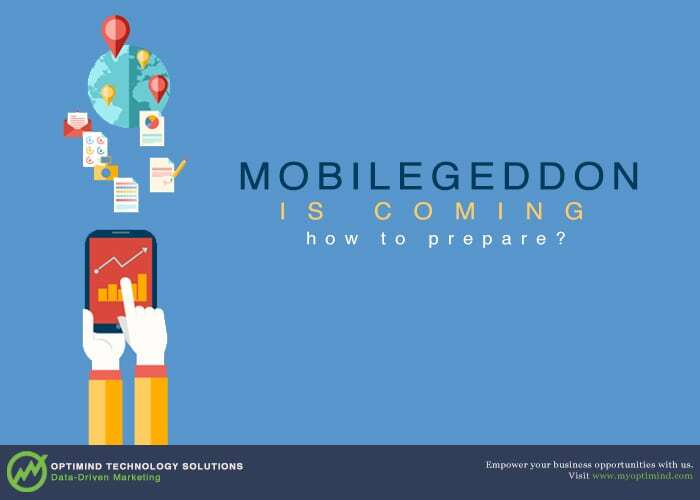 Mobilegeddon is really coming so do it now, not later. Mobile usability will be an important factor, as a ranking signal for search results, in where your site shows up in search results on mobile devices, allowing you to gain higher chances of visibility come April 21. In addition to that, you will be able to deliver better search experience to the growing number of mobile users and your potential customers in the future.